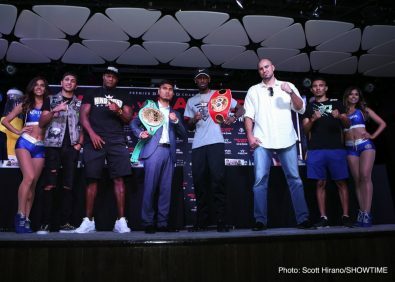 Lightweight world champions Mikey Garcia and Robert Easter Jr. went face-to-face Thursday at the final press conference two days before they enter the ring for a 135-pound title unification Saturday, July 28 live on SHOWTIME from STAPLES Center in Los Angeles in an event presented by Premier Boxing Champions. 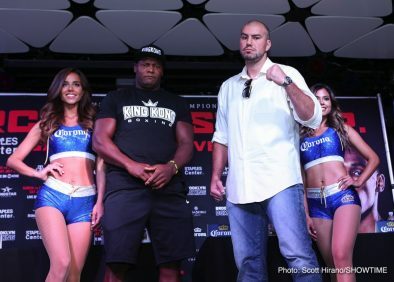 Joining them Thursday and competing on the three-fight SHOWTIME CHAMPIONSHIP BOXING telecast (10 p.m. ET/7 p.m. PT) were Cuban heavyweight slugger Luis “The Real King Kong” Ortiz and former title challenger Razvan Cojanu, who meet in a 10-round bout plus unbeaten super lightweight contender Mario “El Azteca” Barrios and hard-hitting Jose Roman, who compete in a 10-round showdown. “This will be my first title unification match. It means a lot to face another unbeaten champion. It will help my legacy and my career. I’m taking the proper steps to move forward and cement my name for the ages. 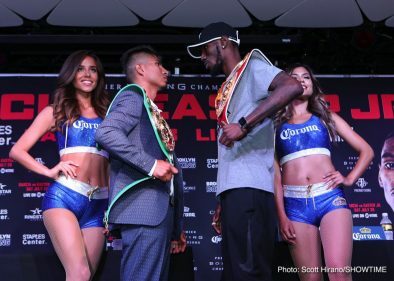 “There isn’t another fight in front of me right now that gets me excited other than this one against Robert Easter Jr. He’s going to come with everything he has. This is definitely his biggest fight and I believe we’ll be able to bring the best out of each other. 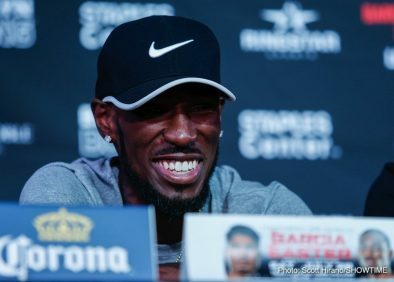 “Me and Robert Easter Jr. are the only unbeaten champions in the division. So in my eyes, the winner is the best fighter in the division. “I’m very happy to be fighting again in Los Angeles. It’s been seven years since I fought here. To give fans a chance to see this big fight live at STAPLES Center is a great thing. I’m very thankful that we could have the fight here. Most opponents wouldn’t have come here. “I’m coming back to STAPLES Center as a world champion and I have a chance to unify in my hometown. There’s nothing better that I could ask for. I’m going to do everything I can to come out victorious on Saturday night. “I’m glad that Robert is confident coming into this fight. I believe that he will show up the best possible version of himself. That’s what gets me even more motivated and excited for this fight. “I really don’t pay attention to being ‘overlooked’ or what my opponents say leading up to a fight. On July 28 we still have to get in there and throw these hands. Nothing said by him or anyone outside bothers me at all. 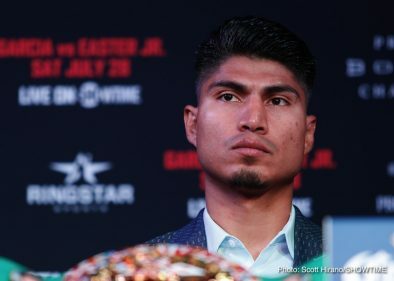 “The only big name Mikey Garcia has beaten is Adrien Broner. I’m going to give him problems. I believe with our skills and record, the winner of this fight is the best fighter in the weight class. “This can add big attention to my career. It can help me get the recognition that I deserve. I look at all my fights like a big fight, but obviously this is unification. You will see two warriors in there on Saturday. “It’s been a long time since I made my pro debut at STAPLES Center. You’re going to get a lot of action and excitement on Saturday night. Expect the unexpected. “I had such a great training camp with coach Cunningham and my dad. It was all boxing all the time and really what I needed heading into a matchup like this. “Everyone will be able to see my hard work pay off on Saturday night. I’m not the one who likes to talk about it, I want to show everybody what I got. “These are the kind of fights that I’ve always wanted to be a part of. It’s a big fight that I know the fans are going to really enjoy. I’m going to give them something to remember. “There’s always risk in any fight. We’re very well-prepared for this big challenge and Mikey is in a great place mentally. Easter is a tall guy who I’m sure will try to use his reach and fight from the outside. But we’ll be ready for whatever he brings. “This is obviously a big fight for Mikey against another elite boxer. When two undefeated guys are unifying, it’s always big. We had great sparring partners who prepared Mikey to be at his very best. “Robert has always been a tremendous fighter and an excellent boxer when he wants to box. 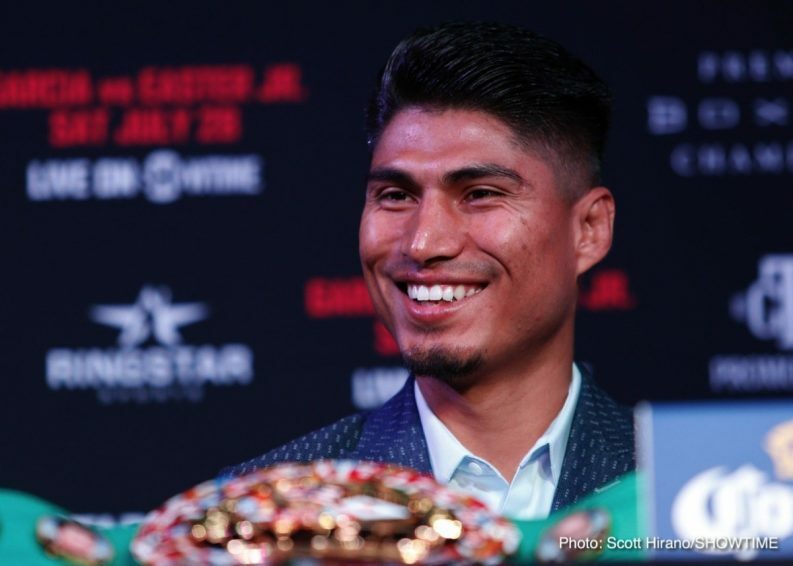 We just put extra emphasis on how we want to fight Mikey Garcia. Robert has the natural skill and ability, plus the size and reach to get this done. “We’re prepared to dictate the tempo, control distance and range and do everything we want to do. We’ve done it so far in camp and we’re going to bring it into the ring on Saturday night. “I always feel very confident about Robert’s chances every time he steps into the ring. We had a good camp and I know he’s ready. He’s always ready, just like he’s been for every fight leading up to this one. “This fight is going to live up to the hype. Robert is going to go out there and show the world what he is really made of. “My hunger and motivation to become world champion has not changed at all. My opponent is very big, but in the ring everyone is the same size. We’re going to be smart and I’m going to do my job on Saturday night. “The Wilder fight is what it is. It’s the past now, and I don’t regret it. At the end of the day I want the rematch and I believe I deserve the rematch. They’re still running from me and they’re obviously running from Wilder, but I’m running from no one. 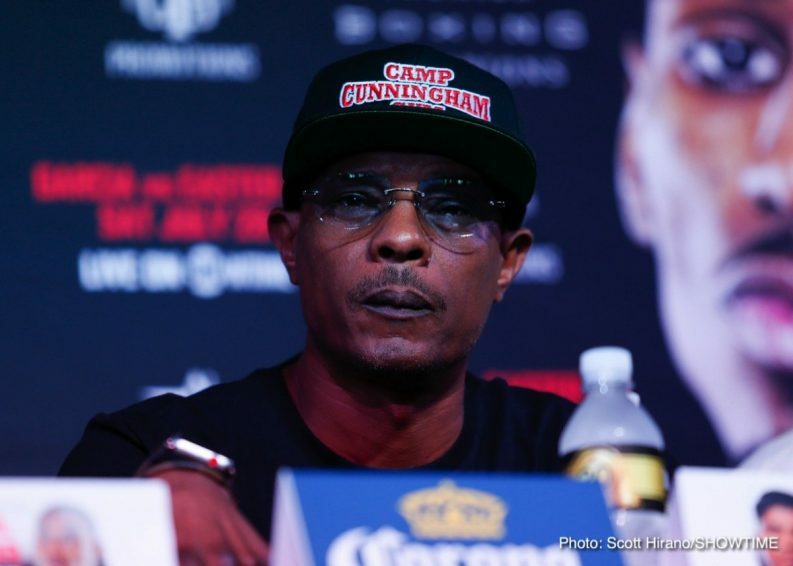 “A victory on Saturday night will put me back in line for the rematch with Deontay Wilder. Fighting is what I know how to do, and that’s what I’m coming to do on Saturday night. We’re both hungry for a win and we will see who comes out on top. “I am very ready for this matchup. When we got this call, I was already in shape. We just had to make the adjustment to fighting a southpaw. We have about a month of really fun sparring leading up to this fight. “I feel very comfortable against the southpaw, especially one that everyone is familiar with like Ortiz. I know I have the skills to take home the victory. “This is definitely the toughest test of my career. I’m very happy to have this big fight. This is going to be the breakout performance that I’ve been looking for. “Whichever title is available to me is the title we’ll go after. It doesn’t matter who I have to face, I’ll be ready. I’m gunning for the very best. “This is a great opportunity to make my debut on SHOWTIME. This is a card packed with talent, but I plan on stealing the show. I’m going to show everyone the kind of fighter that I am. 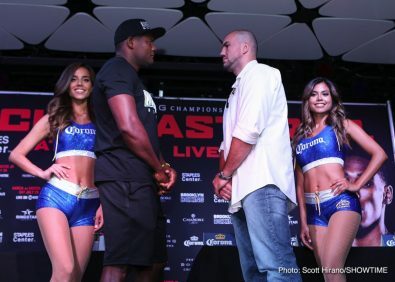 “Barrios’ best weapon would be his speed and his range and I think we have the perfect game plan to oppose it. I know that I have to be patient in there because I have a difficult opponent. I’m doing this for my family and no one can stop me. 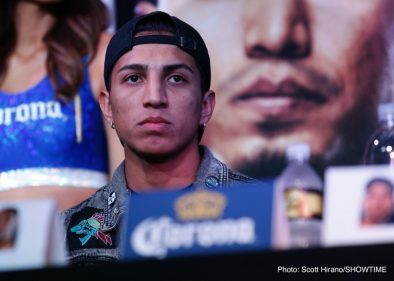 “A win over Mario Barrios would be huge for me. The fans can come in there expecting a war between two Mexican warriors who will leave it all in the ring. “This is a top to bottom amazing card. It’s a boxing spectacular taking place here at STAPLES Center. We have a little bit of everything on this card. 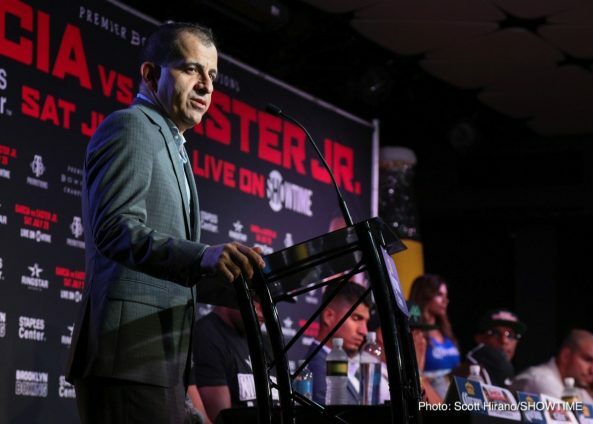 That includes talent from Robert Garcia’s gym, plus 2016 U.S. Olympian Karlos Balderas, who I believe will one day be headlining at STAPLES Center one day. 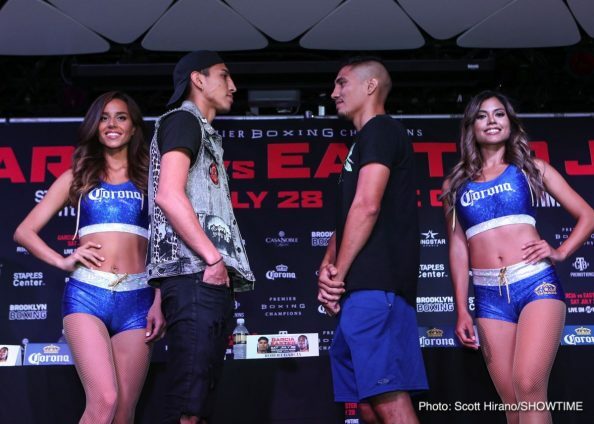 “The televised portion of this card has a stellar lineup as well, including an undefeated Mario Barrios, who represents Texas well and makes his state proud. He’s one of the most exciting fighters in the division and will have a tough challenge in Jose Roman. 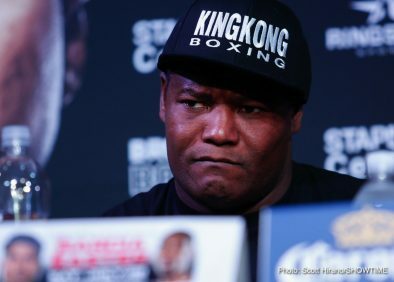 “Luis Ortiz is the kind of fighter that you just don’t want to miss a minute of when he fights. 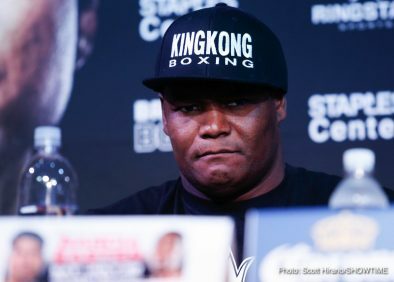 He is coming off of one of the best fights of this year, when he challenged WBC heavyweight champion Deontay Wilder. “There are fighters who say they want tough fights and then there are fighters who actually take tough fights. There’s a big difference between these two. 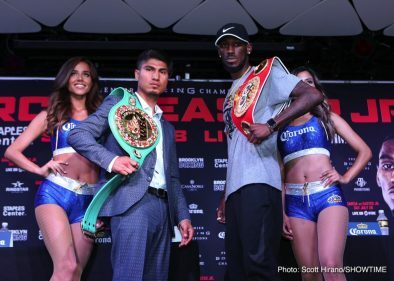 Mikey Garcia and Robert Easter Jr. are the fighters who actually take the top fights. “This is the third world title unification on SHOWTIME this year. No other network has delivered this level of fights to boxing fans. That’s more world title unifications than all the other networks combined this year.